The stamp on this card is quite unusual – it is commemorating the Canadian Para Olympics which were held earlier in August 1976 and were the 5th Para Olympics, where amputees and visually impaired athletes competed for the first time. The only stamp produced by Canada to mark this event was 20 cents and features a mixed-media painting of an archer by Tom Bjarnason. Julian lived round the corner from the first house I can remember. Our mums were friends and would often take us to the park. When we moved back to the area the friendship was rekindled. Julian went away to boarding school and we would write to each other regularly. Being fickle teenagers, sometimes we were romantic, other times each of us pursued love interests elsewhere. The wording on this card suggests it was sent to re-ignite romance! I have lost touch with Julian, but our mums are still in touch. I was lucky enough to see Niagara Falls when I was visiting the Canadian boyfriend some years later. Many of the highlights of Dorset are mentioned here, in what sounds like a busy week. The weather was obviously good, for November, as it isn’t mentioned! It is interesting to read Anne’s description of the countryside since she came from Cornwall, which is generally reckoned to be one of the most beautiful counties in the UK. The Old Harry headland pictured and Studland Beach from which it projects are both protected by the National Trust, so will remain unspoilt for generations to come. They are also part of the South West Coast Path which starts at Studland and finishes at Minehead, Somerset. 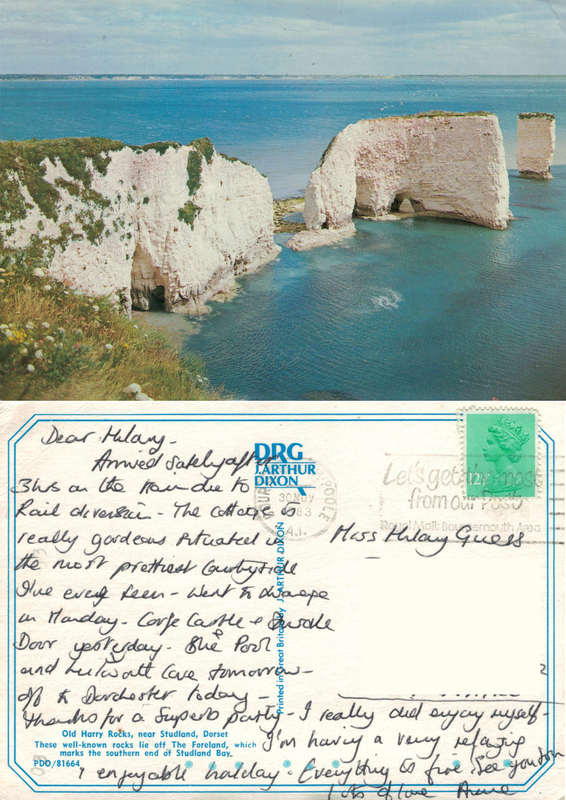 The postmark date is Bournemouth & Poole, 30 Nov 1983 and the stamp is a second class 12½p for a small postcard. Despite not including the now obligatory post code, the card was still delivered. The party that she refers to was for my birthday. I met Anne when I was in Norway, we were both working as children’s nannies/mothers’ help. We were both away from home for the first time and formed the instant bond that comes when you’re sharing an intense experience. Our friendship continued once we were back in the UK; Anne was my maid of honour when I married and we visited each other when we could. Young families are demanding and we both felt the strain; Anne turned to me in a moment of need; I was less sympathetic than I could have been; I disagreed with her choices and was not diplomatic. As a result we (or more honestly ‘I’) could not maintain the friendship or recover the closeness that we’d had in Norway. I have lost touch with Anne. 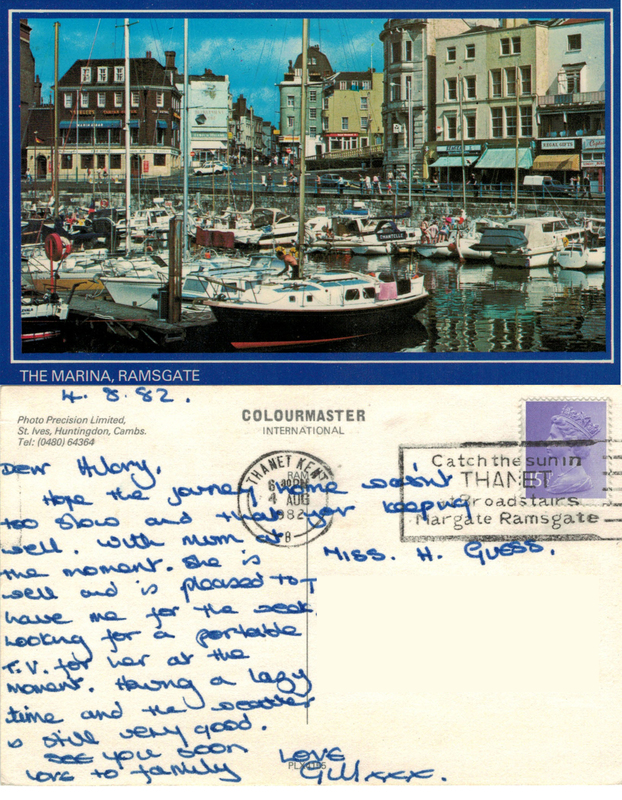 A postcard from my teenage years – the postmark date is 3 July 1980. In the years since leaving my original junior school Janet was a dedicated, detailed card and letter writer. The other postmark says ‘Be properly addressed Post Code It’. Some six years after post codes became a requirement on all addresses, the post office is still reminding us; eventually it will be the SatNav that forces the British Public to embrace post codes! Photo’s of holidays were savoured after the event in those days – there was nothing better than developing a roll of film three or four weeks, or sometimes a couple of months, later and reliving the entire trip in a mere 24 or 36 shots. 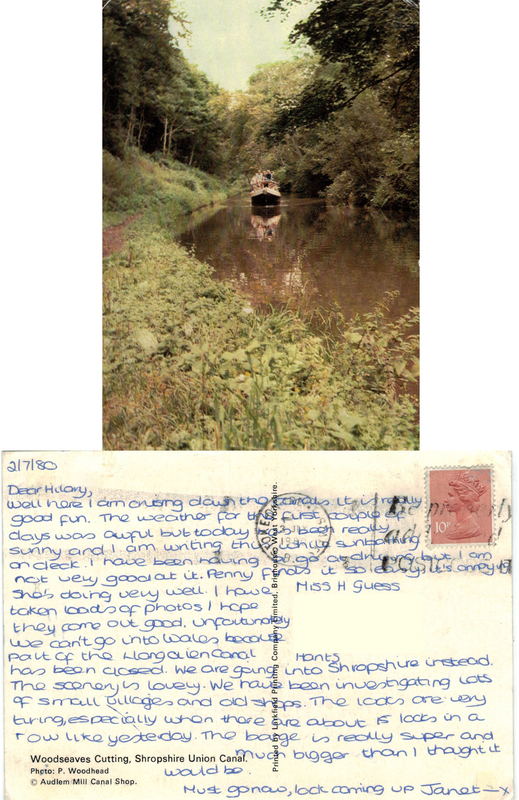 Canal holidays became very popular during the 1980’s as many were restored to their former glory by British Waterways and volunteers. What were once working waterways became part of the growing leisure industry offering the opportunity to experience a slower pace of life – negotiating locks is a time consuming process. The Llangollen Canal, mentioned, was part of this re-branding and restoration. Janet and I were at infant school together, and became friends at junior school. 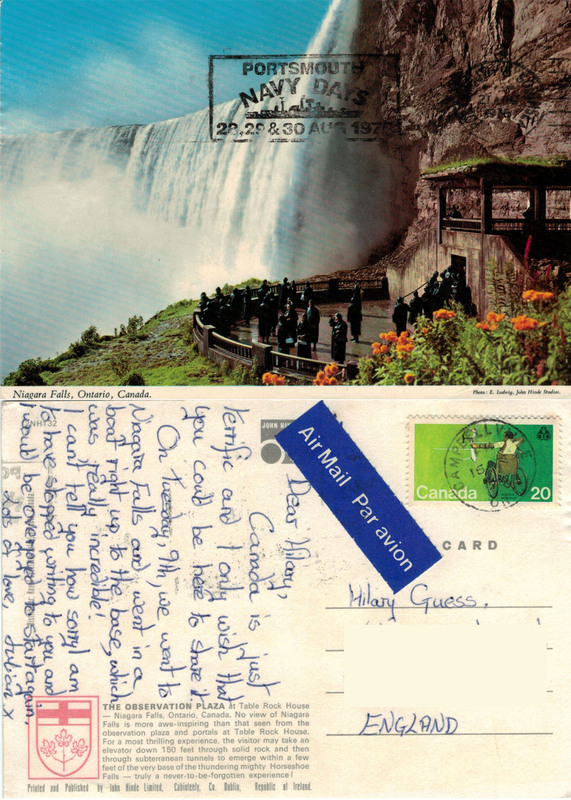 We have stayed in touch via cards, letters, the odd visit and latterly emails. We met up a few years ago when we were both approaching fifty – apparently we both still look the same. Janet recently discovered an old photo of her, me, Ida and Ida’s sister all round for tea at her house, some time in the early 1970’s The photo has now been scanned and saved digitally for evermore.